Troutrageous! Fly Fishing & Tenkara Blog: Redington - New To Fly? Redington - New To Fly? A representative from Redington sent me an email yesterday, if you write a fly fishing blog, you may have received it too...that's typically how these things work. Anyway, they are quite proud of the "New To Fly" section of their website and asked me to pimp it a bit. So I figured why not?...it actually is quite cool. So what will you find? A little bit of everything. From Flies 101, to tips on spotting fish, to a ton of different videos that show different casting techniques, this is about as comprehensive (& easy to understand) resource for beginning fly fisherfolk since the Curtis Creek Manifesto. Heck, even if you're a grizzled, fly fishing veteran, it's still fun to click around for a bit...and I'll bet you'll learn something new. Got some time to kill today...give it a try. It's pretty slick. Redington didn't give me anything to post this. A PR person representing one of their sister companies sent me a boot bag once upon a time, but that's it. I've written posts about that item already, so I no longer consider myself indebted. I simply posted this on their behalf because I'm rad, and I think the interactive tools are cool. I got the same. I suggested that they add us to the product review team and possibly sponsor an outing for us. If this really is the coolest thing since the Curtis Creek Manifesto, then I'll have to check it out. I was just thinking about that book the other day. I hadn't seen anyone mention it lately... and then here it is. OK, maybe not as cool as the CCM, but the bugs section in the flies 101 part is pretty sweet. Sounds like we have similar taste in gear. Two handsome & intelligent guys like us, it's not surprising. It's really weird how fast these companies copy each other. Just two weeks ago a friend sent me an email about Cabela's Fly Fishing University. Basically the same exact thing Redington is doing. I guess one figures they can do it better than another. Kind of like Orvis coming out with a "casting practice rod." That sound familiar? Yeah, those practice rods are a dime a dozen now... Personally, I'm glad these companies are at least trying to engage. 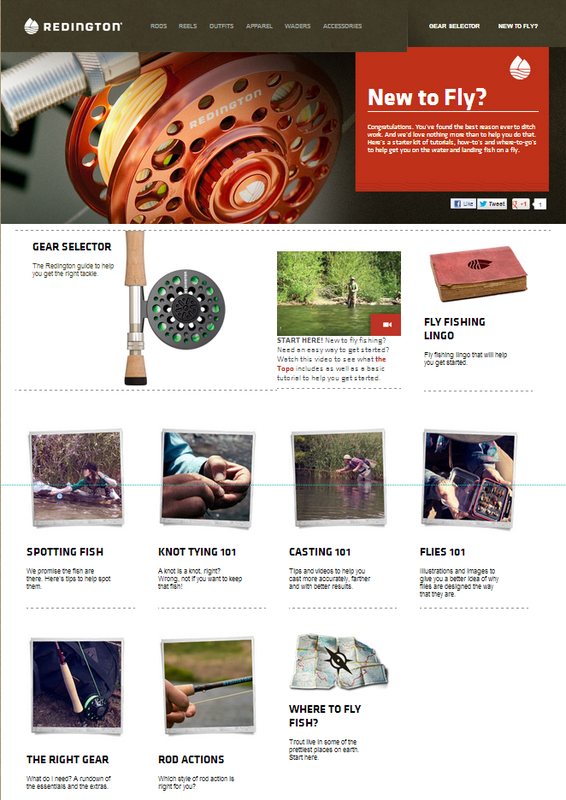 I will definitely be checking out this site after work, and I will be purchasing their Crosswater 590-4 5wt rod. I have been looking for a nice starter rod for a while and didn't want to break the bank. This will do it. Thanks for the tip. They make nice products Ricky. I've never cast a Crosswater, but owning 2 other Redington rods myself, they're great for the price. The more companies do this the better. I remember starting out and cruising the web for fly fishing 101 information. Lots of good stuff out there and it just got better with Redington's page. Thanks for sharing. I love reddington. I use them exclusively. I pimp their gear because they kick @$$!